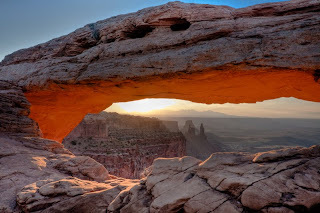 We’ve all seen hundreds of pictures of Mesa Arch in Canyonlands National Park in Utah. It’s an iconic image and a location that is hugely popular with photographers from all over the world. You may well think it’s been over-photographed, but the temptation to add this to your portfolio if you get the chance is just too good to an oportunity to miss. It’s almost the holy grail for photographers and besides, for amatuers like myself it’s a chance to compair your own results with the big boys and see if your technique is up to scratch. 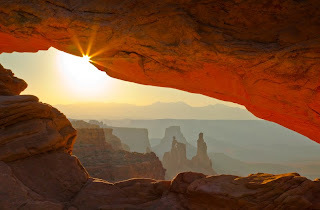 This summer (August 2009) a family holday touring Califiornia and South West USA, brought such an opportunity to me.Part of our holiday included 4 nights in Moab to visit Arches and Canyonlands National Parks. We travelled up from Page and had 3 full days to explore both parks, although after 3 weeks of travelling the family had become a tad travel weary. One day then, was set aside for time by the pool and shopping. We visted Canyonlands on the first day and I made sure a walk to Mesa Arch was included. We arrived early afternoon and the slightly overcast weather restricted any photography to just holiday snaps. I made a mental note however, of how long the hike took and where was the best placement for my tripod. I got up at 4:30am the next morning. I’d heard Mesa Arch can get very busy and wanted to make sure I got a good spot. From Moab it’s 38 miles to Mesa Arch. 11 miles out of Moab NW on highway-191 you find the turn on to UT-313, Island In The Sky Road; follow this and it takes you all the way there. The park entrance is about 20 miles down this road with the Visitor Centre soon after. A further 6 miles brings you to the parking lot for the Meas Arch Trial. I’d been told to allow 1 hr 15 minutes in the dark, but did the journey easily in under 50 minutes. There are 2 trails from the parking lot. I took the one on the right as it’s a little shorter. It was till dark when I set off so a head torch is necessary. Just as I set off another car pulled up and I could see other lights in the distance; still I was first and that’s what I wanted. It’s about a 10-15 minute, comfortable walk from the parking lot over a well marked trail. There a gentle climb up and over some stepped sections and then the trail drops down over a shot section marked by occasional small stone cairns and old pine logs. By the time I reached the latter light on the horizon meant I could make out the shadow of Mesa Arch. I set up my tripod where planned and within a few minutes two other photographers were unpacking theirs. We chatted whilst setting up our gear. It turned out Jim and I were new to this location, but Tom had been several times before and was happy to provide some helpful tips. Turned out he thought I’d got the best spot too. Tom told us the sun would rise just on the left flank of the La Sal Mountains on the horizon; in the Winter it moves to the right. I had already checked the compass on my watch and had researched sunrise for most of our holiday locations back in the UK. You’re also pretty close to the Arch at this point (just a few feet) so the wider the better and I slected to use my Canon EF 16-35mm F2.8 zoom lens. There a pretty big drop off the edge too so care must be taken setting up in the dark. As soon as the sun broke the horizon we started shooting as the underside glow to the arch occurs pretty quickly; you’re pretty much shooting directly into the sun too. You’ve got a 15-20 minute window to get the best shots. Once the sky brightens significantly the glow fades. To get the foreground in focus I found I was shooting at pretty much the smallest apperture (F22) although I did try some up to F16 (the sweet spot of this lens). I found it hard to focus at first, but once there was enough light I selected just one focus point aimed at the farthest point of the underside of the arch within my frame. This involved angling the head to get the focus spot on the right part of the arch, autofocusing, then switching the lens back to manual focus, and re-framing (being careful not to alter the zoom) before taking the picture. If you want to get a nice start-burst then you need to work with a very small aperture and pinch the sun on the underside of the arch. For once I found not having a centre column to my tripod a major drawback as it became awkward and too time consuming to adjust the hight to the position of the sun. Tom seemed a dab hand at this and captured many really nice start-bursts. I thought I was doing OK from what I saw on the LCD, but later on my laptop I realised I had terrible lens flare and never did achieve a decent start-burst (flare is a problem with this lens). I found my best shots were with the sun hidden behind the upper part of the arch. I used a cable release and mirror lock-up. I bracketed my shots too, shot in RAW and processed my files in Lightroom. I returned the next day this time using a EF 24-105mm F4.0 lens, and adding a polariser to maybe help reduce flare. Although much better, I still didn’t capture the type of start-bursts that Tom achieved. Placing the sun off-centre helped. I also tried some different angles, like framing the crest of the La Sal Mountains under a similar contoured part of the underside of the arch. One shot at the far right of the arch I also thought worked well. I moved the tripod back after the other photographers had left and took a few frames to stitch into a panorama which I cropped to remove any sky. This I think worked quite well too. All in all I think I got some good shots and really enjoyed my visit to Mesa Arch. If you get the chance don’t pass it up.